However, Michael Jackson made a splash via hologram and Timberlake accepted his awards via video from overseas while on tour. A hologram of Jackson made its debut, mirroring the late star's signature dance moves as some members of the audience became emotional. 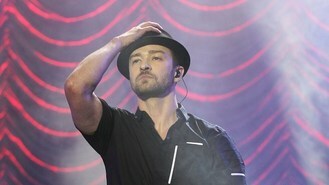 Timberlake won seven prizes, including top artist and Billboard 200 album. "All the other finalists, Miley, Imagine Dragons, Bruno, Katy, I love you guys, it's not a competition, but if it is, I won!" Timberlake exclaimed, dancing with his band. The Jackson hologram performed Slave To The Rhythm, a song from Jackson's new posthumous album Xscape, along with a plethora of background dancers. It was easily the biggest moment at the awards show. "We tried to do as best we could what we thought Michael would have loved, and those of us who knew Michael really well, we had a good perspective on it," Epic Records boss LA Reid said backstage. Reid worked on the album and released it. Robin Thicke, who won four awards including top Hot 100 song for Blurred Lines, debuted a new song called Get Her Back, aiming to win over his actress-wife Paula Patton after they announced in February they were separating. He sang on bended knee and ended with the line: "I gotta get her back tonight." The night featured a number of collaborative performances, including an explosive duet from Carrie Underwood and Miranda Lambert, while double winner Luke Bryan and Florida Georgia Line were crowd favourites when they performed This Is How We Roll. Miley Cyrus performed The Beatles' Lucy In The Sky With Diamonds with Wayne Coyne of the Flaming Lips remotely from the United Kingdom, where she was on tour. "I have to of course thank all of my amazing fans...Thank you everybody for making this (expletive) possible - oops I'm on ABC, sorry," she said when accepting top streaming artist, sticking out her tongue at the end. Katy Perry, who won top female artist, also performed remotely. Lorde was a double winner, taking home trophies for best new artist and rock song for the ubiquitous hit Royals. The New Zealand singer performed her new hit Tennis Court in her signature black - and showcased her signature twitchy dance moves. Other performers included John Legend, who sang his current No 1 hit All Of Me on piano, a sultry Shakira and Jennifer Lopez, who received the icon award and performed at the beginning and end of the three-hour show.